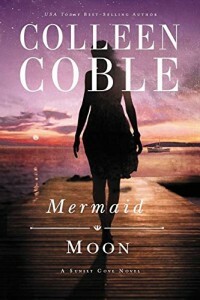 Mermaid Moon by Colleen Coble is the second book in the Sunset Cove series but it can be read as a stand-alone. 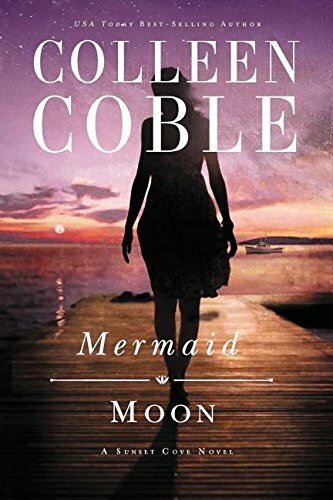 Once again Colleen Coble has written a fabulous contemporary murder mystery novel with a hint of romance. I was certainly hooked from the beginning. Fifteen years previously Mallory left her home town following her adopted mother’s death. Now she returns with her daughter Haley in tow as well as her friend and neighbour Carol, as Mallory’s father turns up dead in suspicious circumstances. Mallory meets up with ex boyfriend Kevin. The two of them turn super sleuth to solve a mystery dating back fifteen years. There are many themes within the novel including that of guilt. Mallory blames herself for her adopted mother’s death. For fifteen years she has carried her burden. Her Aunt Blanche tells her “don’t ruin your life because you think that is all you deserve.” Mallory is trapped by her own guilt. She thinks that God is punishing her. She is unaware that her prison is of her own making. Mallory needs to take all her guilt to God and move forward in her own life. Tied in with the guilt theme is that of forgiveness. Until Mallory can forgive herself, she will be forever trapped in the past. There are some very angry characters within Mermaid Moon. Some feel their anger is justified but it is merely leading to bitterness and ruined lives. Others are angry because they have been hurt. “Trust was hard to drudge up out of pain.” They need to take their hurt and pain and anger and give it to God, and learn to trust again. Money plays a major part within the novel. There are very rich characters and there are characters who are just making ends meet. Money can be used for good but the love of money above all else will ultimately lead to evil and the downfall of a greedy person. The theme of family permeates the novel. There are many different families – blood family; adopted family; single parent families – what they all have in common is love. Love will unite families and create bonds that will not be broken. The characters are all exceedingly well drawn. It was easy to empathise with young widow Mallory trying to raise her daughter whilst struggling with money and wracked with guilt. As the reader I longed to see her give herself a break and move on from her past. As her Aunt Blanche wisely said “God isn’t holding it over your head, you’re the only one doing that.” Kevin too was a struggling single parent to a daughter Sadie who had been blind from birth. Sadie was delightfully drawn and bought out the mothering instinct in me. Mermaid Moon was a great story. It kept me guessing to the end and had me on the edge of my seat. It is the perfect blend of mystery and romance. I was given a free copy of this book. All opinions expressed are my own. Sounds like a good book to add to my TBR pile. Thanks for the honest and thoughtful review. Hope you have a great week!